Noble Master Developer's Blog » Demise of Nations: Rome – in the Works! Demise of Nations: Rome – in the Works! After throwing around a few ideas internally last year, Noble Master Games have decided to develop a hexagon turn-based strategy game. It will take place during the Roman Era on a large map of Europe featuring many factions from that time. The game will include several single player scenarios and campaigns. 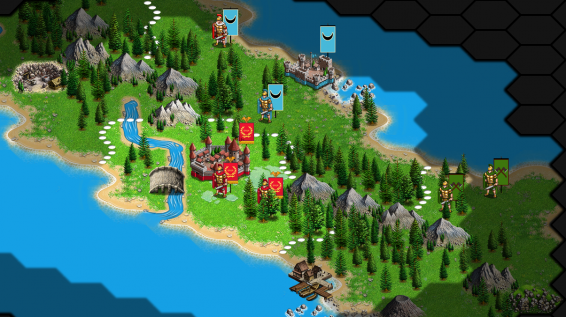 Demise of Nations: Rome will support a wide array of operating systems including PC, Mac, Linux, Android, and iOS. The game is planned to be released later this year in 2013. Demise of Nations: Rome will contain over 30 factions, each having their own uniquely created banner to distinguish them from each other, much like the ones shown above. Confirmed factions include, Armenia, Britannia, Carthage, Dacia, Egypt, Gaul, Germania, Greek Cities, House of Brutii, House of Julii, House of Scipii, Macedon, Numidia, Parthia, Pontus, Rebels, Scythia, Seleucid Empire, Senate SPQR, Spain, and Thrace. In later era scenarios and campaigns, other factions will appear, Alemanni, Berbers, Bergundii, Celts, Eastern Roman Empire, Franks, Goths, Huns, Lombardi, Roxolani, Sarmatians, Sassanids, Saxons, Slavs, Vandals, and Western Roman Empire. Below is an early alpha screenshot of the game. Please contact us if you would like to be part of the beta-testing team. Looks amazing! Looking fowards to it! Not enough hexagon based games out there. I would be honored to take part in a beta of this game. If I may throw my 2 scents in, troop generation, and troop carry over to next missions (if any) are a good idea. Looking forward to the game’s release.